If you're looking to get out on the road on a sporty bike with café racer styling, look no further than Suzuki's SV650X. The SV650X is a brash, middleweight bike propelled by a smooth-revving V-twin engine tucked into a slim and lightweight trellis frame. 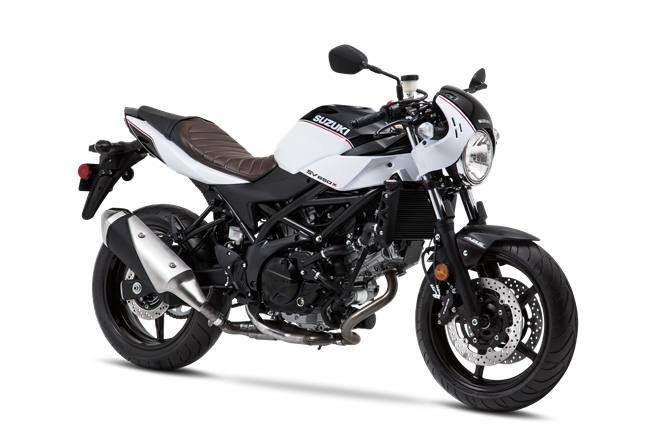 And there's more, as the SV650X combines power and agility with classic café racer looks. Whether in stop-and-go city traffic or on country roads, this bike delivers exhilaration and riding fun. No matter where you pull up to park, the retro appeal of the SV650X is unmistakable with its bikini fairing above the headlight, corresponding clip-on handlebars, a tuck-and-roll-look seat, and blacked out controls. Mix in your favorite stretch of road and you'll see that this café bike's smooth V-twin power and agile handling make the SV650X an exciting ride with unmatched curb appeal. The SV650X's two-tone, Glass Sparkle Black/Pearl Glacier White bodywork is complemented by blacked out wheels, controls, and chassis components. Visually stunning, the trellis-style frame is fashioned using high-strength steel tubes so it contributes to the motorcycle's low weight and trim chassis. 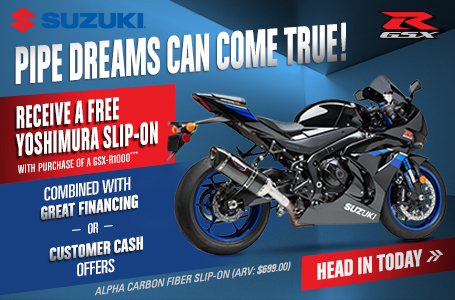 Advanced EFI system includes Suzuki's Low RPM Assist feature that seamlessly adjusts engine speed during takeoff and low-speed running to smooth the power delivery and to help eliminate the possibility of the rider stalling the motorcycle. The engine's 90-degree L-twin configuration has perfect primary balance, so a heavy, power-robbing counter balancer is not needed. Suzuki's innovative L-shaped piston rings contribute to reduced blow-by gas, resulting in less emissions and greater combustion efficiency. Suzuki Composite Electrochemical Material (SCEM)-plated cylinders reduce friction and improve heat transfer and durability. Both cylinder heads feature Suzuki's original Dual Spark Technology for greater combustion efficiency, better fuel economy, and cleaner emission. The fuel injection system employs Suzuki's innovative SDTV (Suzuki Dual Throttle Valve) with 39mm throttle bodies. The secondary throttle valves are controlled by servo motor for smooth power delivery and optimum combustion efficiency. Suzuki's patented Throttle-body Integrated Idle Speed Control (TI-ISC) eases starting, stabilizes the engine idle speed, and helps lower emissions. The system is compact and lightweight. The TI-ISC on the SV650X incorporates Suzuki's Low RPM Assist feature that seamlessly adjusts engine speed during takeoff and low-speed running to smooth the power delivery and to help eliminate the possibility of the rider stalling the motorcycle. 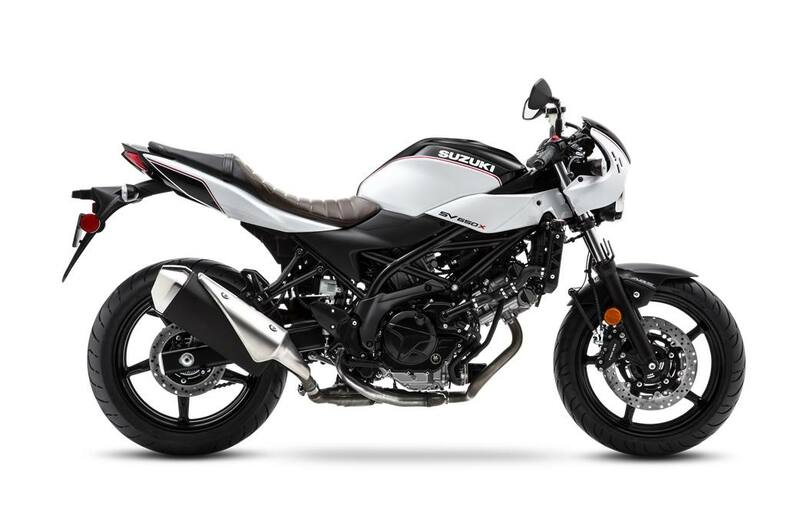 The SV650X also features Suzuki's Easy Start System that lets the rider start the motorcycle with a momentary press of the start switch without pulling in the clutch lever when the transmission is in neutral. The compact, lightweight chassis is covered with slim bodywork to create a bike that's agile and fun to ride on a variety of streets - such as city traffic, highway, rural roads and winding roads. The high-strength steel, trellis-style frame is key to the motorcycle's trim and intelligent dimensions. The seat height is just 785mm (30.9 inches) and is the lowest in the 600-800cc street bike class. The rear shock's spring pre-load is seven-way adjustable so you can easily adjust for a passenger or cargo. The clip-on handlebars and mid-set foot controls create a riding position that's ideal for sport riding yet retains enough comfort for longer rides.